At the core of the many accolades accorded to the MAKO 18 LTS is great design and Plascore PP Honeycomb. As it does in automotive, recreational and industrial applications, Plascore PP Honeycomb delivers more performance for the dollar by reducing structural weight while increasing performance of laminated cores, all at an attractive price point. Used in the deck and structural liner, both of which have Class A Surfaces, PP Honeycomb outperformed other polypropylene cores in extensive lab testing. Because of those test results, the award winning 18 LTS has featured Plascore PP Honeycomb since day one. 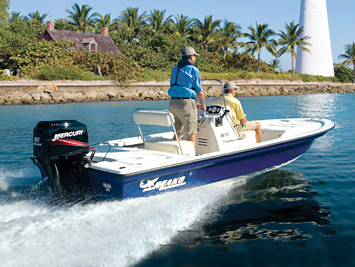 From decades of experience and a passion for building quality fishing boats, the Tracker Marine Group team delivers excellence to anglers with the highest expectations for their boats. Now, Plascore PP Honeycomb is on board. For more information visit Tracker Marine Group at www.trackermarinegroup.com.